Larpen Metallurgical Service is the leading supplier of graphite products and carbon additives throughout North America. Larpen is annually selling over 75,000 tons per year of our graphite and carbon additives to the foundry and steel industry. With our growing line of GRAPH-HEX products we provide a reliable product that produces excellent results. LMS also supplies low sulfur petroleum cokes, silicon carbide, and other related materials. 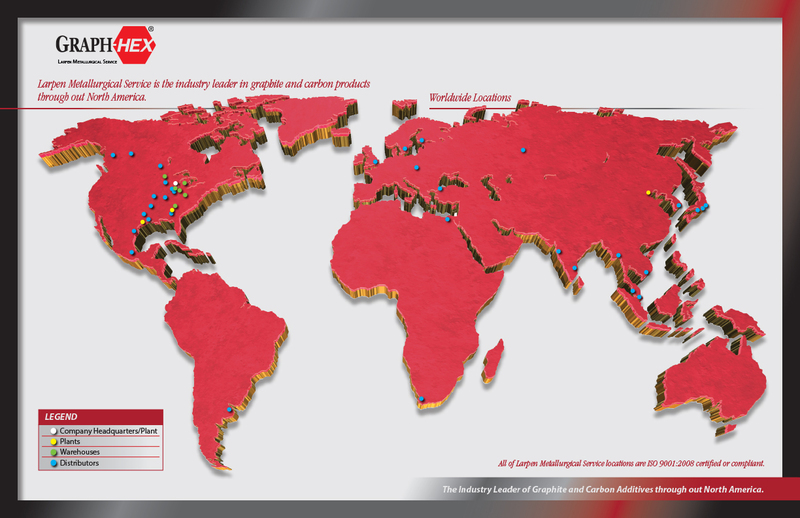 Larpen’s GRAPH-HEX products are available worldwide through any of our convenient locations and are currently being sold in over twenty countries. As an ISO 9001:2015 certified company, we continually work to provide consistent and quality products to meet our customers’ needs. Larpen Metallurgical Service is the industry expert at adapting and designing graphite and carbon additives for process of the foundry and steel industry. Since 1962, we have delivered expertise in service, quality, consistency, and flexibility. Utilizing our own production and world wide sourcing of only the highest quality raw materials combined with our state of the art manufacturing facilities, Larpen can design and tailor a product suitable to each individual customers needs. Our technological advanced processes allow us to produce the highest quality economical product in the market. Today, Larpen is the market leader of developing and supplying high quality products to the metallurgical industry in North America. Our company produces, sources, and delivers a wide range of graphite and carbon products. With manufacturing and warehousing facilities covering strategic geographic locations through out North America, it enables us to provide the most consistent and reliable deliveries to foundries and steel mills. It is Larpen’s goal to provide 24/7 customer service and 100% on time deliveries to our customers’ worldwide.